← MEPNs go to diabetes camp! Monday, August 3rd was an action packed day for the incoming MEPN Class of 2017. 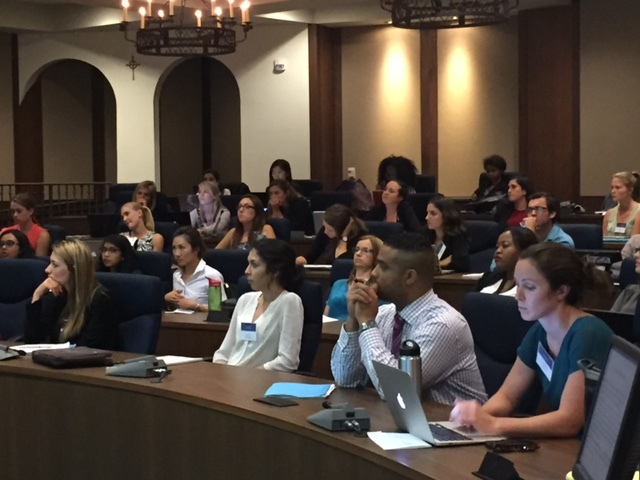 Students started at 0800 with a welcome by Dr. Linda Urden, and some pearls of wisdom from Dean Sally Brosz Hardin. The rest of the day was followed by presentations about topics ranging from dress code in the lab and hospital setting, how to do a literature review, and test taking strategies, to name a few. The day ended with a little practical advice for surviving and thriving in the MEPN program. Read below. Every morning make your bed. You will have accomplished the first task of the day – it will give you a small sense of pride and encourage you to do another task and another task throughout the day. Making your bed reminds you little things in life matter …if you can’t do the little things right, you can’t do the big things. You’re going to be doing big things in this program. Nursing school, at the graduate level, is different from your undergraduate education. You will be learning an entirely new language consisting medical terminology, nursing and medical diagnoses, plans of care, and you will also be taking graduate level courses. Make a calendar. Use it! Don’t procrastinate, study every day. Start tonight! You can’t learn this stuff by cramming the night before a test. Every course is assigned a certain amount of units. Each unit is equal to 3 – 4 hours of studying per week. For example, Fundamentals of Nursing, starts in September and is a 3 unit course. You should be studying at approximately 9-12 hours per week (3-4 hours per unit) just for this class. Add up your other classes and do the math. You should be putting in a lot of study time. Have you ever gone to Mission Bay and noticed the rowers gently gliding through the water? You probably noticed they were paddling in unison, each rower dependent on the other for success. Success depends on collaboration, both in the hospital and in the academic setting. My advice to you— Success in the MEPN program is greatly enhanced if you find someone to help you paddle. That means form a study group, participate in class, read your textbooks, do the Kaplan practice questions, and be a part of some of the extra-curricular activities such as GNSA. Don’t compare your grades, your lab group, your clinical group, anything. There will be time when you think your peer is assigned to a ‘better’ hospital for a clinical rotation, or a time when your classmate gets the better lab schedule, or a time when another clinical group gets to participate in a terrific community outreach program and your group is unable to participate. That’s just the way things work out. Overall, everyone is going to get a stellar experience; make the most of yours. This is a tough one. I just got through telling you how much you need to study and participate in activities but it will be a lot easier if you get regular sleep, eat healthy meals, and check in with your loved ones/friends on a weekly basis. Note: I didn’t say ‘see’ your friends on a weekly basis. This program is all-consuming. You may have to miss a family wedding, or your best friend’s birthday party in order to be successful in the MEPN program. Trust me, when May 2017 rolls around, your family and friends will be so proud of you and your accomplishment that they won’t mind so much you missed a party here and there. In closing, look to your left and look to your right. These people sitting right next to you are future Clinical Nurse Leaders (CNLs). The classmates you meet today will become lifelong friends and colleagues. The road to graduation will be rigorous, there may even be some tears along the way, but the School of Nursing faculty has decided you can do it- that’s the reason you’re here. I am here to tell you, it will be worth it. 1 Response to Welcome to MEPN Class of 2017 !